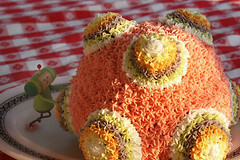 If you're a fan of the video game Katamari Damacy, you'll certainly appreciate the thought behind this cake. It seems we are not alone in our love of the Popeye's biscuit. NYC Enjoy a slow Sunday at Slow Food USA's Urban Harvest & New Amsterdam Market this Sunday, Octoober 2nd. New Amsterdam Market will be held from 10:00am to 2:00pm at the New York City Municipal Building (1 Centre Street in Lower Manhattan); and The Spirits of the Region, a three hour unlimited tasting of the region’s best handcrafted wines, beers, and ciders at the Institute for Culinary Education, (50 West 23d Street.) from 2:00pm to 5:00pm. Both venues will showcase artisanal and sustainable products from New York City and its hinterlands, including New York, New Jersey, Vermont, Massachusetts, and Connecticut. This vast region corresponds closely to the lands that were once claimed by the Dutch as the New Netherlands, with New Amsterdam as its capital. FoodGoods, a company that creates t-shirts for foodies, will donate all proceeds from the sale of its “MAY THE SPICE BE WITH YOU” shirt to the Share our Strength Hurricane Katrina Relief Fund. Designed specially by FoodGoods and New Orleans chef Susan Spicer of Bayona Restaurant, the tee celebrates Chef Spicer’s eclectic global cuisine to bring hunger relief to those are in need after Hurricane Katrina. Link: Share our Strength's Hurricane Relief and Recovery Fund. This seems a bit silly: "...The U.S. beef sommelier graduates, with training from the U.S. Meat Export Federation, will be goodwill ambassadors for U.S. beef and recognized experts, who can reassure consumers that there is no safer beef than U.S. beef and accurately inform them about the attributes of individual U.S. beef cuts and dishes." 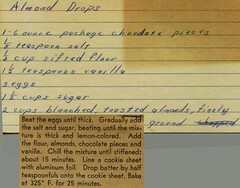 Mom's Recipes: scanned and shared on Flickr. 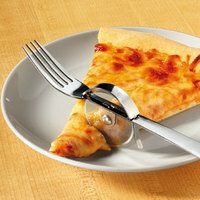 An excellent idea. 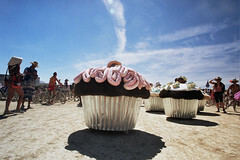 I'm a big fan of airconditioning, indoor plumbing and not seeing hippies & geeks naked, so yeah, I don't get excited over Burning Man at all, but how cute are these cupcake art cars from this year's sojourn into the desert?